A few days ago, I have searched about for modern arcade cabinets, and through some internet forum or so, I came across Arcooda, known for its fish machines, and then discovered it has various arcade-like cabinets for home and commercial units. While they do have pinball, videmption machines, and arcade cabinets with home console plugins, I noticed one line of products that strikes me out: Game Wizard. 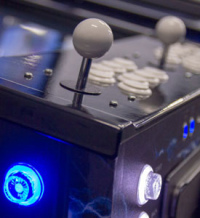 Those are arcade cabinets that can play home console and PC games with high quality joysticks and buttons. The one particular product that strikes me most is the Game Wizard Xtreme Coin Op Edition, that does support arcade hardware and pcbs, whether old or new ones. One of the distinct features is that operators can allow time limits on play per credit for home consoles. The caveat is that players require accounts for their particular platform to play on the machines to stay legitimate. Games built with insert coin, such as arcade motherboards and pcbs do not have to require timers. I am most impressed that it is essentially a 2 player evolution of the Veiwlix arcade cabinet (the majority i've seen from round one are 1 player only cabinets for head to head games) with more buttons and trackball controllers (looks like 2 trackball controllers per player). As of now, the orientation of the cabinet is only horizontal (no vertical orientation yet). Have you ever got your hands on those machines? Fi so or not, feel free to discuss about the Arcooda product lines. I guess the burning question is will exa arcadia fit inside? How will it handle 4 player games will it link? Will exa consider developing 6p games for the 6p cabinet??? So many questions, time to start mailing! The control panels are a thing of beauty. For questions in regards to Exa Arcadia, please post in the Exa Arcadia thread or use the contact page on the Exa Arcadia website. You can ask Arcooda about cabinet link-up if you want through the contact page. As for the Arcooda game wizard series, I do imagine it would be easy enough to link up machines like any other arcade cabinet, such as the modern Japanese arcade cabinets with 1 vs 1 head to head style. The Exa Arcadia motherboard is smaller than other modern or past hardware so it should fit nicely inside the Game Wizard and Video Pinball units. Apparently, I have discovered that Arcooda has modular control panels for both the game wizard and video pinball machines so that it can play various kinds of games, including arcade boards. The Game Wizard supports horizontal orientation while the pinball machines support vertical orientation for board and horizontal for title attract screen, albeit can be slightly awkward looking down on a flat screen board for extended period of time, despite arcade gaming on cocktail cabinets have existed since the near beginning. You can check out all the detail about the Video Pinball machine below as well as the rest of the products. Probably best not to waste Shou's time with questions specific to some (shall we politely say "quirky") Vewlix clone. will exa arcadia fit inside? How will it handle 4 player games will it link? Same as any other cab. Will exa consider developing 6p games for the 6p cabinet?? ?